A: As often as possible. Most car enthusiasts have their vehicles washed at least once per week. Then there are those who will wash their vehicles daily. As for the daily commuter, we recommend washing your vehicle at the very least once every other week, but if time and finances allow, once a week will keep your vehicles paint in good condition. Q: How often should I wax or polish my car? A: It depends on the environment in which the car is regularly kept. If it is a regularly garaged vehicle, then a polish or wax may last for four to six months. If the vehicle is regularly parked outdoors and subjected to the elements, then there may be a need to have it waxed as often as once a month. In 13 plus years of detailing, it is our recommendation that a light colored vehicles be polished and/or waxed at least every two to three months. As for ark colored cars on the other hand, they will usually require more frequent polishing and waxing as well as other specialized attention. Q: Can I wax my car too often? A: Today’s paints ARE softer and thinner than ever before. So to answer your question, No, you can NEVER wax your vehicle too often. But on the other hand, not waxing it often enough can and will cause painfully visible damage. Note: When waxing be sure not to get any wax on the plastic or rubber parts of the vehicle. A: Auto detailing clay bars are used to remove embedded contaminants from your vehicles painted surfaces as well as glass. 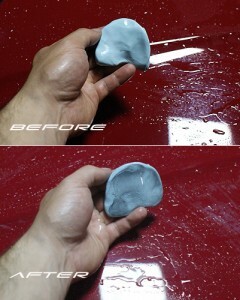 Q: How does detailing clay or a clay bar work? A: Surface contamination won’t budge from the surface of your vehicles paint with normal car wash procedures. These contaminates are even difficult to polish off. Auto detail clay or a clay bar can quickly and easily grab and remove this contamination as the clay bar moves across your vehicles painted surfaces without the worry of any damage to your paint. 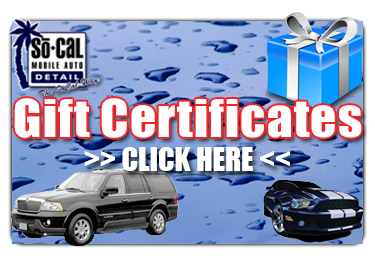 A clay bar works by hydroplaning or gliding over the surface of your paint on a thin layer of clay bar lubricant. It is the Lubricant that helps to keep the clay from sticking to the surface of the paint as the clay removes the bonded contamination. Some fear that they will harm their vehicles paint as detailing clay is an abrasive but it is actually only abrasive to the contamination and not your paint. The detail clay actually safely removes the bonded surface contamination without harming your paint in any way. Q: I lease my car, why should I care about having it detailed? A: You may not care now, but you’ll care when the lease ends. Be sure to check your contract, you’ll find that 99% of the time the leaser is responsible for the appearance of the vehicle when the lease is up. If the paint is dull and lifeless, more than likely you WILL be hit with a reconditioning fee ranging from $500 to $2,000! That can all be prevented with a regular wash, wax and polish program. Take care of your investment! Q: What about once a year detailing products and Services? A:Your vehicle deserves much more than once a year detailing products or services. More than likely your vehicle is the second largest investment you’ve made, after your home. Don’t cut corners on the quality of the products or services you use to maintain it, or the care you give your vehicle. A regular maintenance program of washing and waxing will pay HUGE dividends for years to come. The inferior weakness of once-a-year products will become painfully visible as the years come and go. Q: What cities do you service in San Diego County? 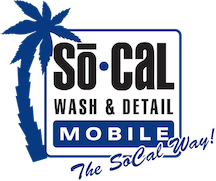 A: SoCal Mobile Auto Detail & Wash covers about 80% of the county. Below is a list of the cities within San Diego that we cover. If you are near one of these cities we more than likely cover your area.